When Joe Hockey says "the age of entitlement” is over, writes James Wight, he really means welfare for the disadvantaged is over — the entitled will continue to be so under the Coalition. LAST WEEK, the Government refused to provide $25 million of assistance to struggling cannery SPC. “... the age of entitlement is over, and the age of personal responsibility has begun." 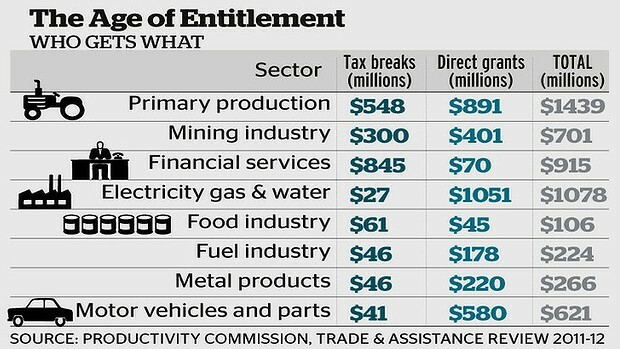 This opposition to “entitlement” is an emerging narrative of the Government’s, with Abbott stating “we don’t believe in corporate welfare”. 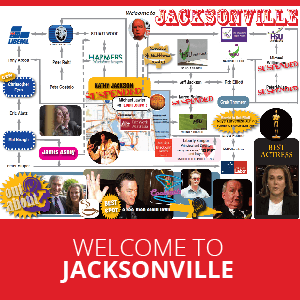 Hockey’s choice of the word “entitlement” is a prime example of right-wing spin. It sounds almost like it belongs in a left-wing critique of privilege, power, and big business. Dig deeper and you’ll find the Government’s real intentions are the opposite of what the spin suggests. Employment minister Eric Abetz spruiks the Coalition party line when he says that SPC is “over-generous” to its employees (and more reasonably, that it is owned by a huge multinational — Coca-Cola Amatil). However, Liberal Party backbencher Sharman Stone, whose electorate includes the cannery, points out that SPC’s problems are not caused by extravagant wages and working conditions, but by unrelated factors such as extreme weather, the supermarket duopoly and increased imports. So, it can be concluded that Hockey is not taking a principled stand against corporate welfare, but instead he is using the withdrawal of government assistance as a stick to punish employees for standing up for themselves. This would be very welcome news if “sustainable” meant living within the Earth’s natural limits. However, unfortunately, the Government’s idea of sustainability seems to end at cutting costs. The Government is pursuing policies, including corporate welfare, which prop up unsustainable business practices. This year’s budget is set to spend $9.83 billion subsidising fossil fuels (excluding measures made redundant by the carbon price repeal bills). That’s 393 times the subsidy denied to SPC in one year alone. These subsidies were mostly instituted under the Howard Coalition Government and continued by the previous Labor administrations of Rudd and Gillard. The Government not only subsidises fossil fuels, it promotes growth of the industry in other ways too. For instance, it aims to restore the profitability of coal-fired power stations. It is also furiously granting environmental approvals to new fossil fuel mines and export infrastructure projects — and is, in fact, yet to reject a proposal. “.. if you don’t want something to happen on your land, you ought to have a right to say no." Now, so desperate is the Coalition to promote CSG, it recently announced a committee to market it to NSW voters. Meanwhile, the Government is cutting the comparatively tiny renewable energy subsidies. It has slashed the Australian Renewable Energy Agency’s budget, wants to repeal the Clean Energy Finance Corporation and will review the Renewable Energy Target with a view to scrapping or reducing it. The Government's justification is that renewable energy cannot survive without public support – but ignores the fact fossil fuel production is only profitable in Australia today thanks to past and present government subsidies, ownership and supportive policies. The planned Emissions Reduction Fund will pay polluting companies to slightly reduce their emissions per economic output. As those reductions are unlikely to be meaningful, in effect the Fund is yet another fossil fuel subsidy. Even if the money were redirected to legitimate climate action, the Fund’s budget is capped at less than $1 billion per year — paling in comparison to the much larger quantity of fossil fuel subsidies. And it’s not just mining. Across many policy areas, the Government subsidizes the already affluent. 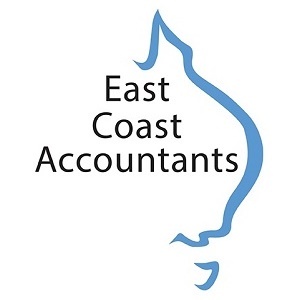 Examples include superannuation concessions and paid parental leave favouring high-income earners, negative gearing and bank borrowing guarantees. The overall effect is an awful lot of welfare for the rich. Similarly, the Coalition has voted for repeated increases in politicians’ salaries, to the point where Australia now has some of the world’s highest-paid politicians. 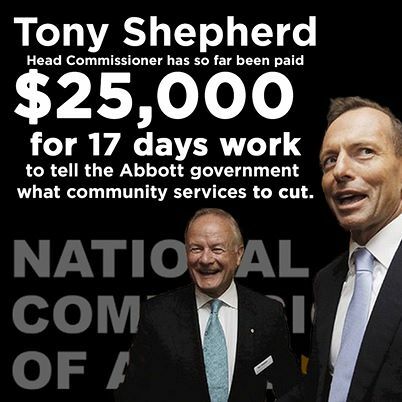 Treasurer Hockey receives $366,000 per year from taxpayers, while PM Abbott gets $507,000. Why, given its insistence on the supremacy of free markets, is the Government so hypocritical about it? "They need to be looked at on a case-by-case basis, but the two that I think you've identified relate to business and business investment. The great criticism of Spain at the moment is that the fiscal consolidation program in Spain involves reducing any incentive and support for business and not taking a hard look at the welfare entitlements of the people." This illustrates the Government’s hypocrisy results from a double standard — welfare for the poor and vulnerable distorts the market and drains the budget, but subsidies for the rich and powerful facilitate investment. The underlying belief system is that those at the top of society deserve to be there. If you’re at the bottom, bad luck — it’s your own fault because you didn’t try hard enough. The left advocates greater government control of the economy to protect the public interest and redistribute wealth downwards. But beneath the right’s rhetoric about efficiency and growth lies a hidden goal, mirroring the left’s — to protect corporate interests and redistribute wealth upwards. That the free market is just a tool to achieve this is evident in the hypocrisy of neoliberal governments. Whenever it suits big business, they suddenly abandon their professed free market principles and intervene to save the corporations — sometimes for immense sums of money. It makes sense when you understand the real goal isn’t a free market, but to make the rich richer and ensure those at the top of society remain there. Privatize their profits, socialize their losses. This is a nuance missed by many commentators bemused by the apparent contradiction between the Government’s stated free market ideology and supposedly “Soviet style” socialist direct action climate policy. In reality, the Emissions Reduction Fund could not be further from a socialist policy. Whereas socialism would give money to the poor, the Fund will give money to rich, powerful industries that don’t need government subsidies. When Hockey says the age of “entitlement” is over, he really means welfare for the disadvantaged is over. Welfare for the privileged lives on. Read more by James Wight at precariousclimate.com or follow James on Twitter @350ppmJames. 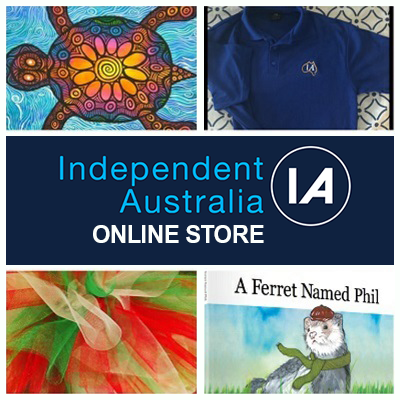 The originals of John Graham's art, featured above as well as throughout IA, are available for purchase by emailing editor@independentaustralia.net.